Let’s catch up a bit through a few recent eats! I think I mentioned in Sunday’s workout recap post that my PMS this month was pretty bad. Not even the mood part so much as the hot flash part. 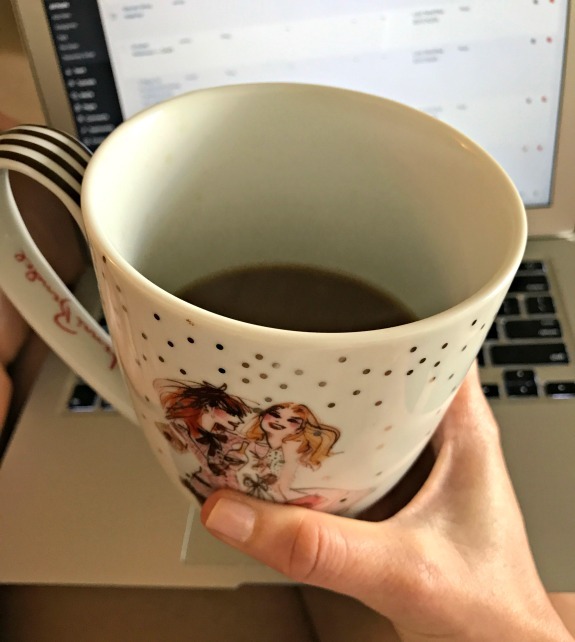 I could barely drink coffee in the morning without breaking into a major sweat! It didn’t stop me but man, it was annoying. It’s not a typical PMS problem that I have but as we know, every month can be different. Thankfully my temperature has regulated itself now that the PMS part of my cycle is over. Even my oatmeal was a struggle to eat, most mornings I just ate it cold. We went to the Islanders game again Monday afternoon on Columbus Day. We had suite seats which were fun and not as cold as the rest of the arena. I know I told you in Monday’s weekend highlights post that the Barclays Center attempts to freeze us all the way out of Brooklyn and back to Long Island. We heard so many people discussing how uncomfortably cold it is in there which made me happy to know it’s not just me who complains. Rumor has it, the announcers bring in space heaters! 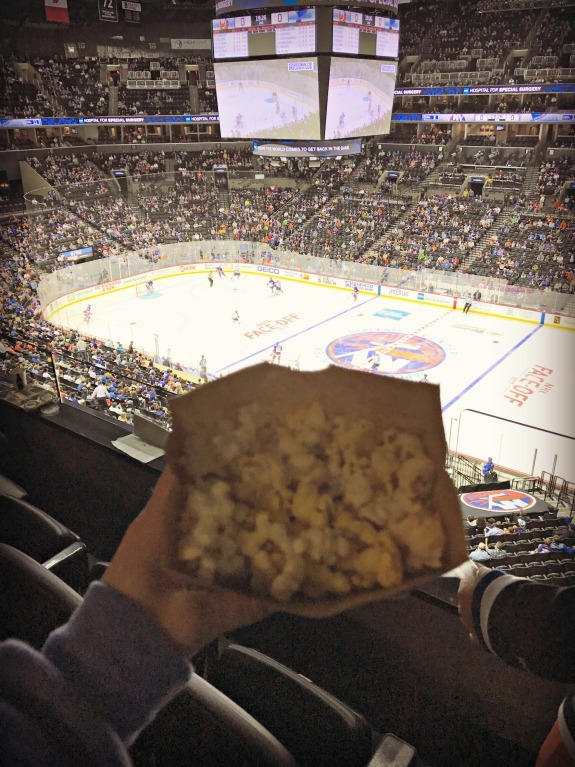 Anyway, popcorn was my snack choice for the game. I had this Maoz salad a few days ago while out and about. 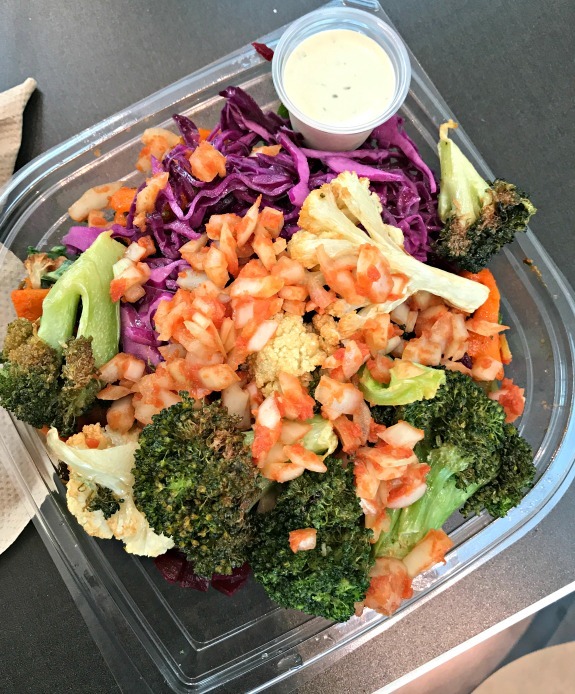 While I used to LOVE Maoz, sometimes this salad gives me indigestion which is not something I get from anything else that I eat. While I don’t know which ingredient does it to me, my guess is the broccoli and cauliflower. I can heavily taste the oil they use to roast the vegetables and I think it’s a bit too much for my system to handle, even if it is delicious. I really need to work from Panera one day this week (maybe today in fact) as my excuse to order a salad for lunch. This Panera salad I create myself (seasonal greens salad with the addition of hummus and avocado) is just so delicious. And my homemade brownies stash that has been in the freezer since the summer is now officially gone. 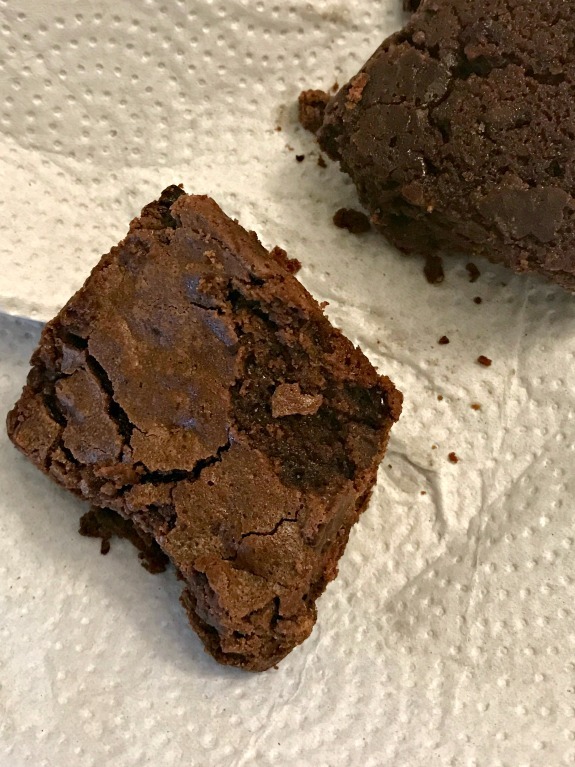 We defrosted the last two brownies as a snack yesterday. I love this super fudgy brownies recipe so I think it’s time to make them again for emergency purposes. Thanks to Laura for hosting today’s WIAW link up! What do you like to order when you get Chinese food? Any desserts currently stashed in your freezer? Do you have a favorite Panera salad that you like to order? So many yummy eats. I always have a hard time drinking coffee and eating oatmeal when I’m hot and I don’t enjoy it nearly as much. Those brownies!!! And currently I have some of my protein fudge bites in the freezer, I always eat two after dinner. Yeah, drinking or eating hot food when hot is not pleasant at all! but my son would probably love it! I keep thinking I need a crockpot. Chinese food, especially leftovers, were the one thing I absolutely could not handle while I was pregnant! My fav is a bowl with steamed veggies and mushroom chicken. 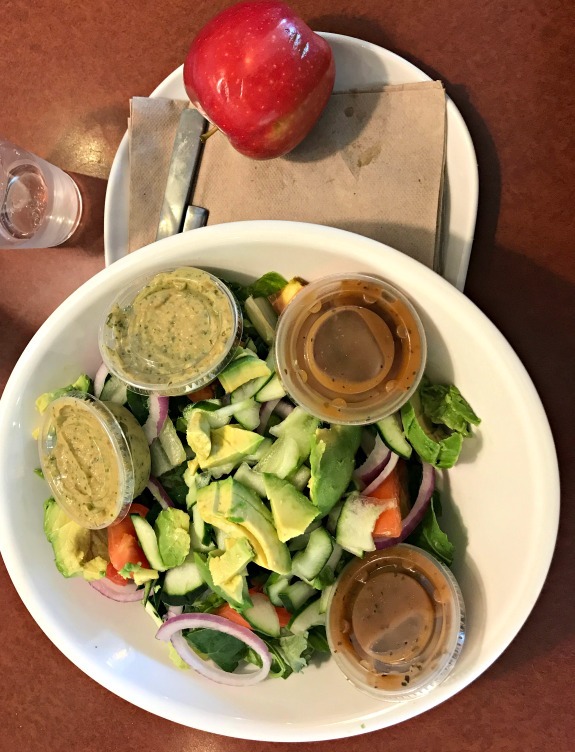 I really like the fuji apple chicken salad at Panera but it’s been a while since I’ve eaten there because they are a bit pricey. you know, I can’t really recall eating Chinese food when I was pregnant. I can’t remember too well but I may have been turned off to it too! I just ate a lot of pizza and Italian food during my pregnancy, that I remember. I haven’t had Chinese takeout since college, but recently some of our friends had us over and made orange chicken and dumpling soup and I could have eaten several bowls of that soup. Chinese dumplings are so good! Whenever I bake a big batch of cookies I always freeze some. Its nice to have a treat to go to later when I don’t have any desserts made! Definitely agree! I need to bake more often so my freezer is always loaded with desserts! I’m with you on the oily food! I think it’s a good idea at the time… then it’s no bueno. Our freezer always has desserts of some sort. Right now it’s filled with pumpkin bread and homemade Samoa balls. I really need to start baking again so that I can restock my freezer stash! Those brownies look SO GOOD! Bookmarking! 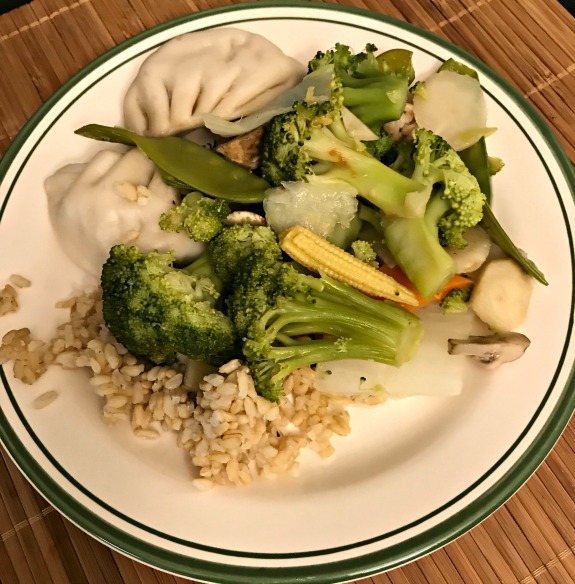 I get Chinese food very rarely, but when I do, my go to is moo goo gai pan, which is basically just chicken and veggies, but it tastes so good! Only “dessert” stashed in my freezer is frozen bananas hehe; college isn’t giving me too many baking opportunities.